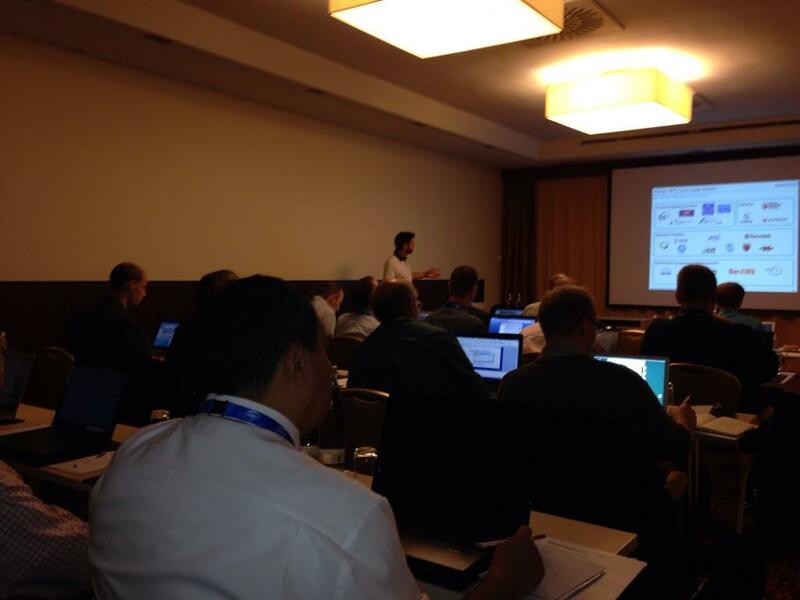 Last week, we participated in the 2013 edition of ISC Cloud. The event addressed currently popular topics such as High Performance Computing (HPC) as a service, industrial and scientific application software in the Cloud, new software licence models, security in the Cloud, computing power and data protection. The event started with a very successful hands on tutorial on “Building your Cloud for HPC, here and now, in 3 hours!”. During the tutorial, the attendees were able to deploy, manage and operate a 2-nodes OpenNebula cloud in their own laptops. 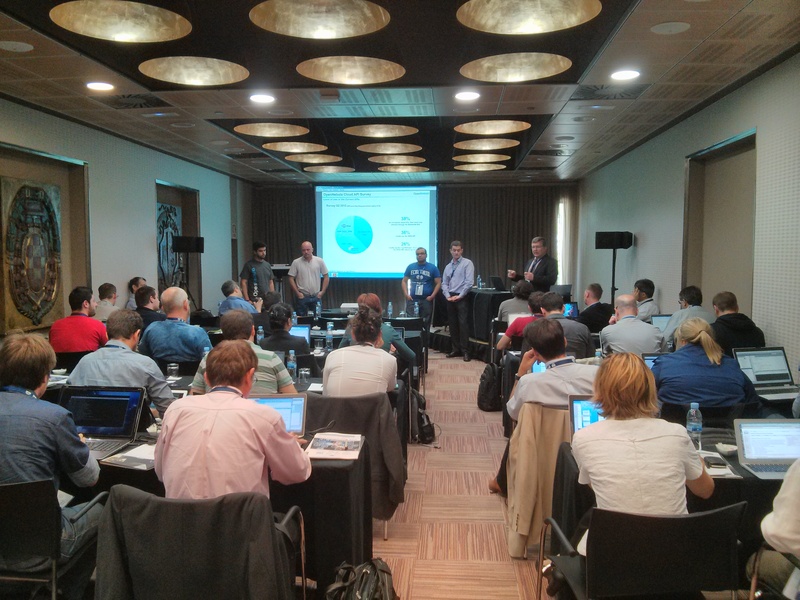 What an interesting week we’ve had at EGI TF and the Cloud Interoperability Week! We had the opportunity to meet old friends, shake hands with users that we only knew by email, and also had the chance to thank some of our community contributors personally. Most of the people we spoke with were already OpenNebula users, so we had a great time hearing from their use cases, customizations and gathering feature requests. The presentation was followed by an interesting session of questions and answers, where different cloud technologies were represented. You can get the presentation slides from our slideshare account. We were a bit concerned about the small time slot assigned to the hands-on tutorial on Thursday, but things went smoothly and practially all attendants managed to get their own OpenNebula cluster with 2 nodes and a couple of VMs. They even had time to configure the rOCCI server and play a bit with it. In our experience as providers of private clouds based on OpenNebula, the single most common request among small and medium enterprises is the deployment of virtual desktops, both in terms of converting existing desktops and moving them to OpenNebula or for the creation of custom environments like computer classrooms for schools. This is, in hindsight, not difficult to explain: a cloud infrastructure brings a set of management advantages that are clearly perceived by end users that are frequently facing IT problems like blue screens, viruses and stability problems. Being able to move from one place to the other while maintaining the desktop VM active, rebooting into a previous snapshot before a virus infection or in general cloning a “good” master VM are substantial advantages especially for smaller companies or public administrations. Then create a new template for the Windows machine, linking as images the converted Windows disk, the small VD image and the Virtio ISO image. Set the network device as “virtio”, and reboot. After the completion of the boot process, enter into the Windows control panel, system and in the device window you will find a set of unidentified hardware devices- one for the virtual SCSI controller, one for the network card and a few additional PCI devices that are used to control the memory ballooning (the capability to pass real memory usage to the hypervisor, so that the unused memory can be remapped to something more useful). For each unidentified device perform a right click and install the drivers by selecting as source the virtio cdrom. Shutdown the machine and remove from the template the small VD disk and the iso image, and now you have a fast and accelerated Windows image ready for deployment. The simplest approach is simply to load the VM images of each desktop inside of OpenNebula, assign a static IP address to each VM and connect using RDP from a remote device like a thin client or a customized linux distribution. The advantage of this approach is that RDP allows for simple export of local devices and USB ports; recent improvements to the protocol (RDP7 with RemoteFX, used in Windows 7 and 8) allows for fast multimedia redirection and several improved capabilities, already implemented in open source clients like FreeRDP. The simplicity of this approach is however hampered by the fact that this capability works only if Windows boots successfully, and if there is no interference in the login process.If something happens it is necessary to connect out-of-band to the console (for example using the integrated VNC console in Sunstone) and solve any problem that may prevent the successful startup of the virtual machine. This approach is also limited to Windows machines, so that if you have a mix with different operating systems you are forced to connect with different tools. This approach works quite well – the VM is stable, performance within a LAN is quite good with no visible artifacts. USB redirection is stable, and it is possible to compile KVM with support for Smart Cards, useful for environments like hospitals or law enforcement where a smart card is used for authentication or for digital signatures. 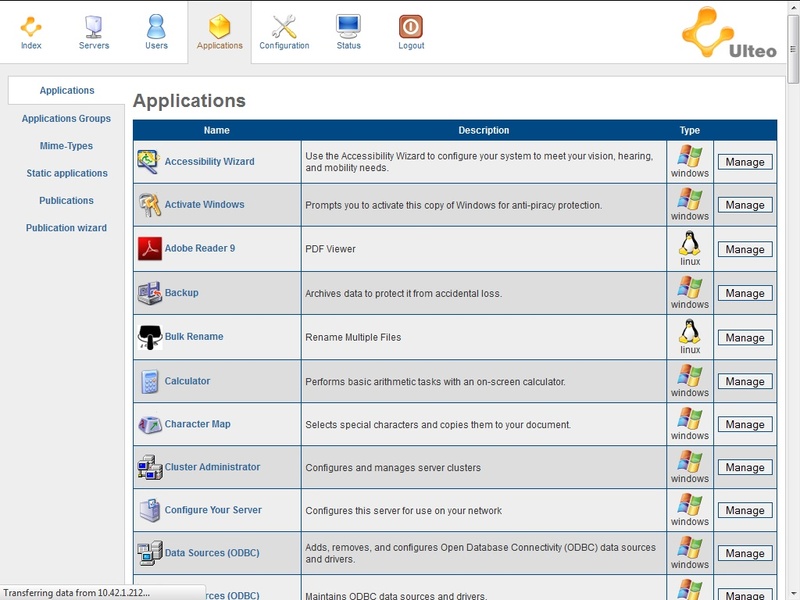 After the configuration you simply point your browser to the Ulteo portal interface, and you get a personalized desktop with all your Linux and Windows application nicely integrated. For a more in-depth presentation, including specific I/O advice on hosting VDI-specific virtual machine, I hope you will join me during the first OpenNebulaConf in Berlin next week. See you there! 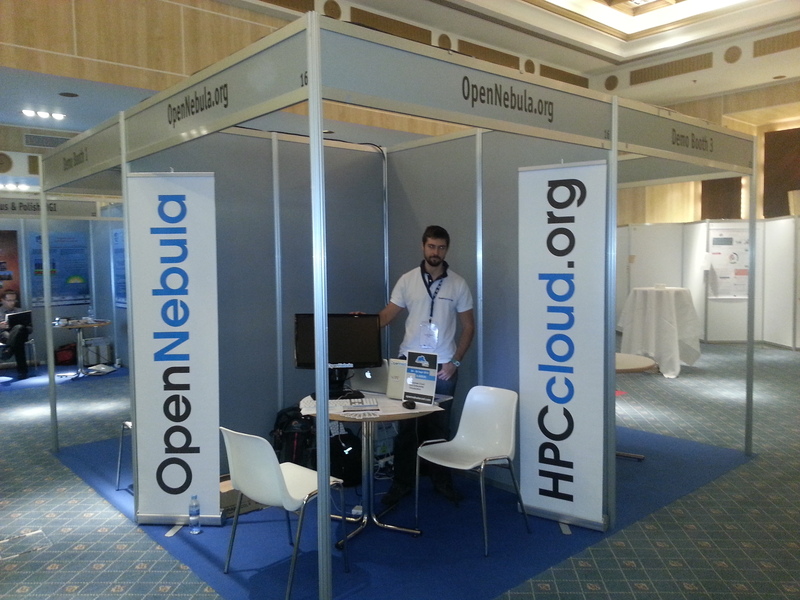 Next week, just before our first OpenNebulaConf in Berlin, we will be busy at ISC Cloud 2013 in Heidelberg. This conference brings together developers, users, managers and decision makers from industry,research, and development to give them the opportunity to find out about the newest trends in Cloud Computing, and participate in intensive and valuable discussions. The event will address currently popular topics such as High Performance Computing (HPC) as a service, industrial and scientific application software in the Cloud, new software licence models, security in the Cloud, computing power and data protection. The invited talk “Cloud Architectures for HPC – Industry Case Studies” will describe the most demanded features for building HPC and science clouds, and will illustrate using real-life case studies from leading research and industry organizations how OpenNebula effectively addresses these challenges of cloud usage, scheduling, security, networking and storage. .
C12G Labs is sponsoring ISC Cloud 2013. It would be great to see you in Heidelberg on Monday! Next week we will be busy at the EGI Technical Forum & Cloud Interoperability Week events in Madrid, Spain. Daniel Molina will talk about Interoperability Features in OpenNebula on Wednesday, 18. Oh, and we will be around in our booth (#16), so come and see us to talk about HPC, Cloud Computing, and play with our live OpenNebula demo. 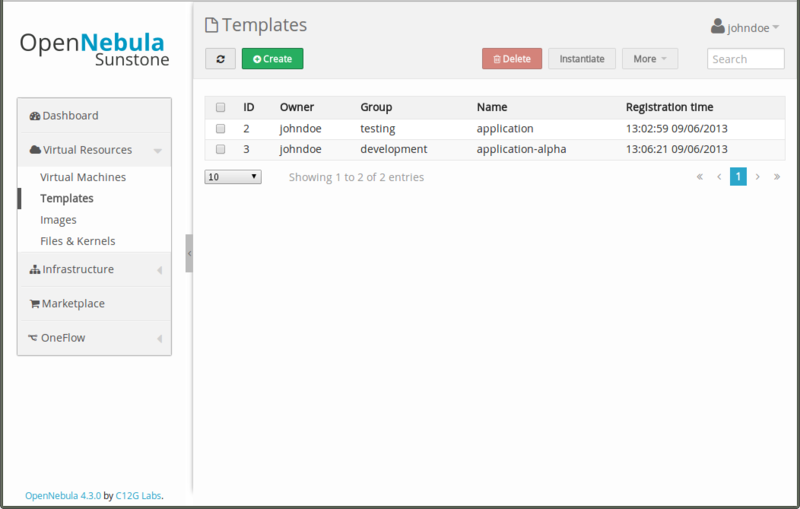 OpenNebula has a very flexible approach to user and resource management. 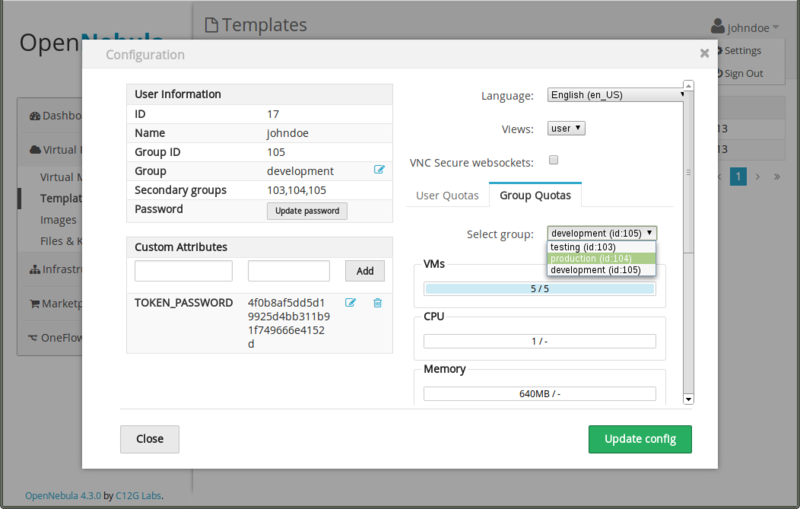 You can organize your users in groups or VDCs, allow them to manage their own resouces with permissions, restrict how much resources users or groups can consume, or implement intricate use cases with ACL rules. The list of images visible to a user contains all the images shared within any of his groups. You can deploy a VM using an Image from one of your groups, and a second Image from another group. New resources are created in the owner’s primary group, but users can later change that resource’s group. Users can change their primary group to any of their secondary ones. Stay tuned for the beta release, we’ll be happy to get your feedback! As you may know, the lineup and agenda for the first OpenNebula Conference (due this 24-26 September in Berlin) is already closed. These high quality contents ensure that the conference is the perfect place to learn about Cloud Computing, and to understand how industry leaders of different sectors are using OpenNebula in their datacenters. There is however still a chance to contribute to the conference, if you are interested. The lightning talks are 5 minute plenary presentations focusing on one key point. This can be a new project, product, feature, integration, experience, use case, collaboration invitation, quick tip, or demonstration. This session is an opportunity for ideas to get the attention they deserve. There are still several lightning talks slots available, so now is the time to register and send us your proposal! https://opennebula.org/wp-content/uploads/2018/11/opennebula_cloud_logo_white_bg-4.png 0 0 Tino Vazquez https://opennebula.org/wp-content/uploads/2018/11/opennebula_cloud_logo_white_bg-4.png Tino Vazquez2013-09-05 09:56:562015-01-13 16:47:55Last Opportunity to Contribute to OpenNebulaConf: Lightning Talks Still Available!